SuperPanda i was trading here since warrant at 30c and mother 70+..
GRACE1966 There is risks building up, lots of contingency and hiding cost in contracting works for overseas jobs . Veron_teo stock market actually is ponzi. the last one loss. you should take profit when it rise significantly. Kc Teh tempted to buy, but always see the selling volume is high, but no doubt next quarter results will be very good. Veron_teo sell q high is good sign lar. paperplane wow, 1.50 soon? with more and more contracts?? Kc Teh how about strong pump from 1.29-1.31 two days ago? ha..
technical wise looks good, may still uptrend. Bigbull99 results should be quite good. the following one will be even better! Bigbull99 ok. Lets see. Their big contract wins will immediately affect this next quarter results. Anyhow they are growing exponentially. Just hold until anything bad happens. Kc Teh this stock is weird, price at historical high, bad market sentiment, buying force still stronger than selling force. maybe too less retailer? Bigbull99 why weird? fundamentally good stock movement is always like that. More and more people start noticing that's why every little drop in price is supported. 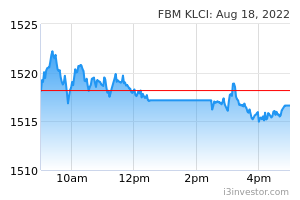 Kc Teh overall results are good and prospect intact, but I think the share price will retrace abit due to high PE. and consider the warrant near expiry. hv sold my wa at 0.795.
wendyuong Hi! Anyone do have experiences. Why so many people dispose the share? wendyuong :-) I stil hold the share, just wonder what’s happening only. Because I’m a new investor. Thanks Yu,Veron! Hunkyman Go buy .... hoot arrrrr !!!! Bigbull99 normally after QR will go into sleep mode for about 1-2 months. People will take profit and wait. so no worries. •	Secured several orders totalling MYR53m. •	Riding on “Made in China 2025” campaign. •	Trading at 14.3x consensus FY19 EPS. What’s New? Kelington has secured several orders totalling MYR53m, bringing YTD job win to MYR146m. The new contracts secured were largely for specialized engineering works under the Ultra High Purity (UHP) segments for wafer fabs in China. The majority of the contracts were awarded by global renowned semiconductor players there. With these awards, Kelington’s outstanding order book is now at MYR406m, equivalent to ~116% of FY18 revenue. Judging from the latest trend, it appears that management’s expansion into China is bearing fruit. Revenue from China jumped 93% YoY in FY18, and the group is set to further ride on the “Made in China 2025” campaign. Exports market is key. Moving forward, export markets will have a significant impact to the group’s profitability. Today, China and Singapore account for approximately 71% of its outstanding order book. Notably, these orders are mainly from the UHP division. Separately, its Industrial Gases division should also do better in FY19, underpinned by higher contribution from the new businesses: on-site gas supply and manufacturing of liquid carbon dioxide (likely to commence in 3Q19). Tender book. Against a stronger pipeline, the street is forecasting a robust 22.2% 3-year EPS CAGR for FY18-21. Note that the group is also tendering for approximately MYR1.2b of projects, across its key operating markets like Malaysia, Singapore, China and Taiwan. Valuation. Brokers are bullish on the stock with two Buys and a mean target price of MYR1.56, offering a upside potential of around 17%. Valuation wise, the stock is trading at 14.3x consensus FY19 EPS of 9.3sen, lower than its 3-year historical average P/E of 15.9x. Investors who wish to invest in Kelington may consider its warrants which are currently in-the-money (but due to expire in Jun 2019). Healthy balance sheet. Note that Kelington also has a healthy balance sheet. At end-Dec 2018, the group is sitting on a net cash of ~MYR50m (~MYR0.17/sh), which is approximately 13% of its current market capitalisation.